My how fast the year has gone by. It seems we were just complaining about the bitter cold and now the unbearable heat is the talk of the day. State Session is fast approaching and I hope it will be a great successful event to end my term as your State Master. We are sorry but the hotel price has increased to $105 per room this year. We have worked hard to keep it low for delegates but they cannot keep it low forever. 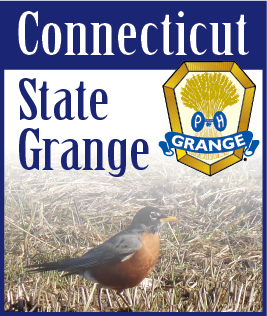 It is important that each Grange send a delegate(s) to participate in the Annual Meeting of the Connecticut State Grange. Non-delegates are also encouraged to attend so you can have an insight into the legislative and committee of the State Grange. Many Grange fairs will be starting and opportunities for membership promotion. Please have members greet the public with personal experiences of what the Grange has meant to them. Share the excitement of your Grange experience. It doesn’t take much space and can reach many people. I attended the funeral of Vivian Shaw of Granby Grange. I assisted the State Chaplain with the Graveside Memorial Service. Sister Vivian Shaw installed me when I was elected Master of Coventry Grange back in the early 80s. Her excitement for the Grange had always impressed me even through the tough times she always had a twinkle in her eye and a big friendly smile. May she enjoy her time in the Great Grange above and enjoy the fellowship of other Grangers above. Well done good and faithful servant. Hey- don’t forget about the “C” dollars contest. For the last two years we have collected all the “G” bills and thought the “C” bills would be abundant, boy were we wrong. These bills are harder to find than a parking space at a Grange dinner. Remember the $50 prize to the Grange that collects the most for large Grange and small Grange. Installation teams are in short supply this year so Granges may have to do their own installations. Follow the Manual and if everyone helps out you can do it. Community Granges, don’t forget about the Honor Grange Awards that are in the Blue Book. If you meet the requirements, submit the entry to the State Master. I thank the Youth members that attended the New England Youth Conference in Brooks, ME. I congratulate New York Youth Drill Team for winning first place. We hope our youth had a good experience in their first time. If any youth are interested in participating in the youth program, please contact Jean Meehan or Ann Marie Knochenhauer to see how you can become a Youth Member. With July being hot as heck, let’s hope that we get relief from this weather for the rest of the year.